Greece is one in a constellation of ancient cultures that formed the foundations of Western civilization. Democracy, colonialism, military strategy, and much more – all can be traced back to origins in early Greek history. In this timeline, we’ll mark the rise of Greece from its preliterate beginnings to its decline and eventual fall to Rome’s superior forces more than 2,100 years ago. The Greek and Roman empires, the Sumerians of Mesopotamia, and the Egyptian dynasties are four of the most important civilizations to have influenced Western societies, even into the modern era. Establishing laws, revering one or many gods, creating voting rights for citizens, advancing science, prizing the expressive arts – we can look back to these ancient societies and recognize the seeds and sprouts that flourished in succeeding cultures. In this timeline, we focus on Greece, which the inhabitants called Hellas (from the Greek Ellás). Starting before the advent of a written language, we follow the development of Greek culture, the often quarrelsome relations the Greeks had both internally and with their neighbors, and the paths that led, finally, to the demise of Greece as an international power. Let’s start this journey by visiting the bucolic paradise that was pre-cultural Greece. A fertile ground for nomadic tribes of hunter-gatherers, wandering herds of undomesticated animals, and wild-growing edible plants, the land naturally develops primitive settlements both along its coasts and interior regions. In this era are the roots of trade. Olive trees are abundant, and regions where they grow become highly desirable waystations for travelers and traders. As the trade routes are established, olive oil emerges as the most important currency of its time. It is during this period that the earliest form of Greek writing – a still-undeciphered script called “Linear A” – appears in the historical record. Around 1,500 BCE, a more familiar-looking form called “Linear B” emerges. It is recognizable enough as a precursor to the Greek language that it has been translated and provides a window into Greek life before more advanced settlements evolved. For that, we need to travel to . . .
By 1,500 BCE, prosperous tradesmen establish increasingly complex and grand settlements. Certain islands in the Aegean Sea and port cities hugging the coast become sites of comfortable dwellings with signs of luxury. Nowhere, at this time, is more prosperous than the city of Mycenae. And not unlike today, wealth is concentrated in the hands of a few VIPs. The privileged group of the time includes kings and other rulers, merchants, and the priests who keep the temples running. Mycenae becomes both a trading and a military power, and by 1,300 BCE is the dominant power of the Aegean. Its wealth and influence are such that this era, from approximately 1600 to 1100 BCE, is called the Mycenaean period of Greek history. Knossos, on the island of Crete, is settled as a trading village and becomes a very successful, prosperous community in this era. Its wealth underwrites a temple that is destroyed (likely by earthquake, or possibly an invasion), and the city fathers are able to finance an even more impressive temple on the site of the original. At the same time, merchants extend trade routes farther west to Iberia and north into the interior of modern day Europe. Not surprisingly, Mycenae’s power and prosperity are envied by its neighbors, both in Hellas and from abroad. 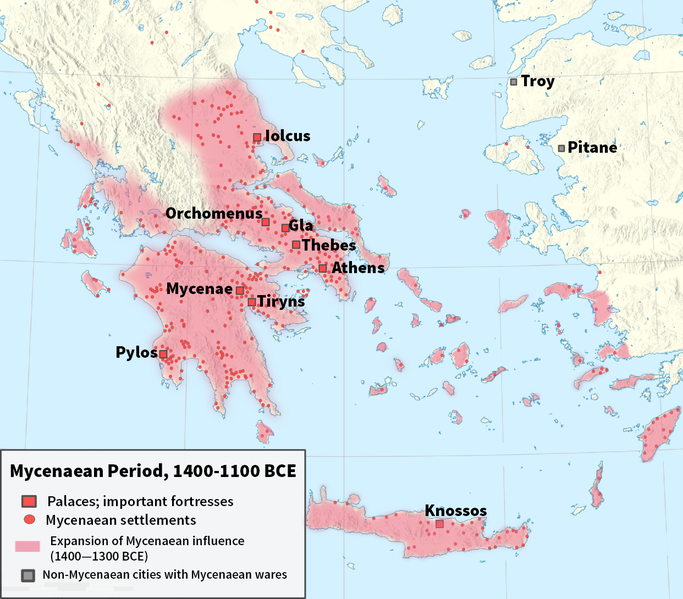 In a plot point that could have been borrowed straight from Game of Thrones, Mycenae is attacked in the 12th century BCE by successive waves of invaders – notably the “Sea People” (likely coastal Anatolians), followed by internal rivals the Dorians – and possibly hit by an earthquake as well. Whatever the cause (or causes), Mycenae dies along with its influence. Why so many earthquakes in Greece? The northern Aegean Sea and mainland Greece both rest upon active fault lines that have, over millennia, caused literally tens of thousands of tremors and quakes. Evidence exists that Greeks may have considered earthquake-scarred zones as somehow blessed by the gods, and they repeatedly rebuilt in the same spots where earthquakes destroyed important structures. Athens, an ally of Mycenae (and no friend of the Dorians), escapes destruction during this time. By 900 BCE it has increased its influence by encouraging non-Dorian Greeks to colonize the west coast of the Anatolian Peninsula, on the eastern side of the Aegean Sea. In the wake of Mycenae’s destruction, this gives the Athenians and their allies tacit control of the Aegean. The wealth, power, and cultural influence of Athens increases steadily in the 9th and 8th centuries BCE. It sponsors the first Olympic Games in 776 BCE, and, during the same decade, Homer’s landmark epic poems The Iliad and The Odyssey are first committed to writing. During this time, Athenian government officials are elected by fellow citizens, rather than appointed. Its citizens accumulate wealth and form mini-dynasties. They pass their land and other valuables from generation to generation. However, by the middle of the 7th century BCE, the importance and power of Athens comes to be challenged by its rival, the Dorian city-state of Sparta, which has become the preeminent military power in the area. Athens is known for its support of the arts and culture. Sparta, however, is quite a different kettle of (very aggressive) fish. The ruling class of Sparta views itself not as citizens of their land but as marauders who invaded the Dorian region and took it over, enslaving the native inhabitants, whom they called helots. Athenians also owned slaves in this era, though not in the same numbers and not with the same mindset as the Spartans. As an invading presence, the Spartans become wealthy by living off the work of the helots, who outnumber them 10-to-1. They are constantly on guard against the possibility of a slave rebellion. All Spartan men are required to defend their city-state, and their military prowess becomes second to none. The rivalry between Athens and Sparta and their extremely divergent cultures will continue for centuries. All citizens are now entitled to participate in the ecclesia, the body that elects archons. Near the end of this century, in 508 BCE, a new Athenian ruler, Cleisthenes, effects more political reform; now, every citizen gets a voice in the demos, the local council in towns and villages. Athens is also becoming more intellectually advanced: Schools are formed for the children of citizens, and the new job description of philosopher becomes widely used. Beginning in the mid-6th century BCE, Persia, arriving from the east, makes trouble for the city-states through a series of sorties and full-scale wars. To resist the Persians, the strongest two city-states, Sparta and Athens, maintain a fragile alliance. These two powers are by no means natural allies, but they perceive the threat posed by the Persians as existential and are determined to stay united for the course of the ongoing conflicts. Over the course of nearly 100 years, Persia is a persistent adversary, first fighting the Greeks over control of the Athenian colony of Ionia (in modern day Turkey) in the early part of the century, and later launching invasions of the Greek mainland in 490 and 481 BCE. Have you seen the 2006 film called 300? It depicts the Persians’ 480 BCE attack on Sparta via the pass at Thermopylae. Spoiler alert: It doesn’t end well for the Spartans. The Persians come perilously close to success in the invasion of 481, but the allied forces of Greek city-states repel them with victories on sea and land, eventually pushing them back to Asia. Finally, after much death and destruction, in 448 BCE Persia agrees to a peace treaty, ending conflict on all fronts. But peace was not to last. Helots, fed up with their treatment, rebel against their masters. When Athens sends a force to assist Sparta, the Spartans infamously refuse the aid and handle the matter themselves. Pericles, who had risked much, is none too pleased with the Spartans’ refusal. Plus, he believes that Spartans can’t be trusted. But, given the external threats, he finds it in Athens’ best interests to negotiate a peace treaty with its archrival. An even greater achievement for Pericles is his introduction of far-reaching democratic reforms in Athens. He permits all Athenian citizens to vote and to participate in the administration of the state. This brings greater equality and civic involvement to the citizens. Who were citizens in ancient Athens? Well, fewer people than you might think. Citizens had to be free, so anyone indentured or enslaved was omitted. They had to be male, so all women were excluded. And citizens were required to be native-born adults, so children and foreign-born adult males were ineligible. It was kind of an exclusive club, and the benefits weren’t bad. The 446 BCE peace treaty with Sparta is a great achievement, but not a lasting one. The Great Peloponnesian War begins in 431 BCE, with Sparta again seeking primacy among the Greek city-states. After much upheaval and many reversals of fortune, Athens surrenders to Sparta in 404 BCE. Despite calls from other city-states to completely destroy the city and enslave its inhabitants, Sparta chooses to spare Athens in recognition of its long history of service to its fellow city-states and against their common enemies, including Persia. Also in the 4th century BCE, another city-state, Macedon, gives birth to Alexander, son of Philip II, whose conquests lift him to legendary status as Alexander the Great. Alexander’s tie to Macedon makes it the most powerful city-state in Greece, above both Athens and Sparta, by 338 BCE. Where Philip II was instrumental in uniting the Greek city-states (sometimes by force), thereby planting the seeds of a national consciousness, it is Alexander who projects Greek power and culture throughout the Mediterranean and Near East, establishing Greece’s international influence in the period that took its name – the Hellenistic Age – from Ellás, the archaic word for Greece. Following his father, who took Macedon to war against Persia, Alexander puts an ignominious end to the Persian Empire by destroying the great palace of Xerxes at Persepolis around 330 BCE. The Hellenistic Age lasted from 323 BCE, when Alexander died at the height of his power and influence, to approximately 30 BCE, when the Roman conquest of the Hellenistic lands was complete. With the rise of Macedon, Athens loses much of its power. However, it remains enormously influential as a center of Greek culture during the Hellenistic Age. Perhaps the coup de grâce is the 146 BCE destruction of Carthage. An outpost of Greek influence and a successor to Macedon’s and Athens’s power, it is situated on the North African coast. With its sacking at the hand of Roman forces, the transition from Greek to Roman dominance of the region is essentially set in stone. Greece, and especially Athens, had an outsize effect on the evolution of Western culture. To a remarkable degree, Athenian democracy formed the basis of the U.S.’s democratic republic. Much of our tradition of liberal education came from studying the ancient Greek historians, philosophers, and natural scientists. And the study of the wars and rivalries of the time has influenced millennia of military strategists. It is a measure of the protean influence of the ancient Greeks that their culture was honored even by Roman conquerors. The foundations of Western Civilization are built upon the Golden Age of Athens, and we are welcome to reap its rewards.